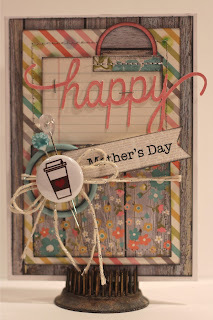 With Mother's Day fast approaching, and time running out, I thought I would scratch 'making cards' off my list. 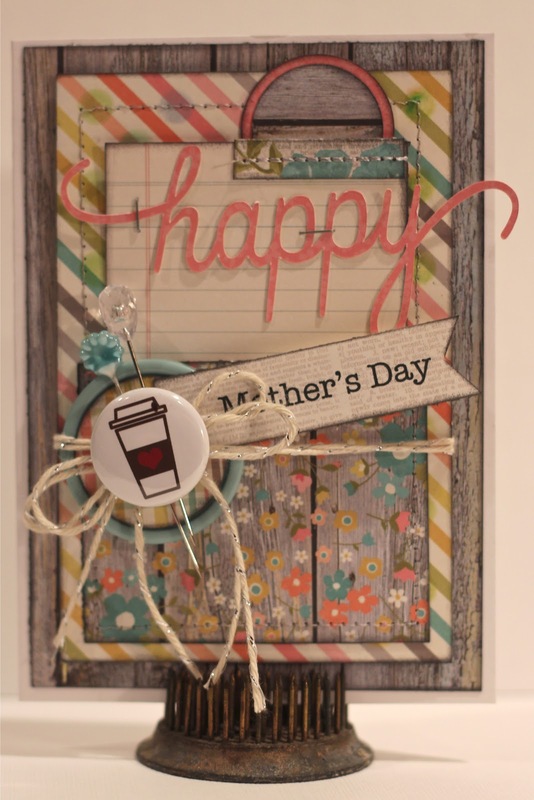 This card can easily be re-created multiple times for any mother in your life. Here I used Simple Stories - Vintage Bliss 6x6 paper pad. If you take a close look, you can see that I dug out my chalks from many moons ago and lightly created a 'polka dotty' look with the Wendy Vecchi - Studio 490's art stencil. With Scotch foam tape, I elevated my stripped paper for dimension. I created a pocket by machine sewing silver thread to accent my Platinum Shimmer twine from The Twinery. I layered an old button with paper, wrapped the twine and topped it with A Flair For Button tin. For a tad more bling, I inserted a crystal Maya Road Trinket Pin and a blue My Mind's Eye pin. The Idea-ology Tiny Attacher is perfect for attaching fine detailing like "happy." I also distressed all of my papers to help tone down the raw edges and help pop the gray with Graphite Black ink pad from Brilliance. My mother is an avid, no, obsessive tea drinker and she will be delighted to receive this card! It will accompany her large pink (another obsession) tea cup plant pot , blooming with pink flowers! Beautiful card, Mary-Ann! I love it and I love that you added the polka dots in the background...so sweet! LOVE this card, Mary-Ann. As an obsessive coffee drinker, I would love to receive this. She'll love it too. Beautiful card Mary Ann! Your Mum is going to loooooove it for sure. Such a cute card, Mary-Ann - showing off those papers to perfection! What a stunning card. Beautiful work. Your card is beautiful Mary-Ann!!! !